Hey, all! Just wanted to let you know that we were interviewed by T.W. and the team over at Marginal Boundaries for their interview series titled, “The Secret of My Success.” I want to give a special shout-out to T.W. 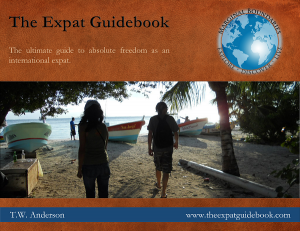 : Even though we’ve been expats for quite some time, we didn’t delve deep into minimalism, location independence, and the ideas of lifestyle design until fairly recently – and not too long before we started this blog. A variety of things contributed to that, but one of the first things I read as we started to get extremely interested in these pursuits was one of T.W.’s e-books. It certainly helped pave the way to where we are today, and more importantly, where we are headed, and we owe some of that motivation to him. We were very humbled and are very appreciative that he invited us onto his site for a chat about immersion travel, being an expat, and how the two-and-a-quarter of us make that happen. (The quarter being our dog, Louis, in case you didn’t know.) You can check out the interview right here, and we both highly recommend that you read his blog regularly, and of course pick up (er, download) his e-books. Rock on, you two (and a quarter)! It’s always such an inspiration to me when I find people who enjoy this lifestyle so much, and especially when I know that something I said or wrote had at least a small impact in helping bring about that change. I know you guys (well technically not both guys but hey!) are pretty stoked for your current Montenegro plans, and personally I can’t wait to tag along as a virtual passenger lol. It was a place I always wanted to visit and yet never managed to when I was in that part of the world, so I’ll be paying close attention. Indeed. It’s quite nice to be associated with like-minded people when it comes to the things (i.e. this lifestyle) we all love more than most anything else. The e-book definitely helped when we started, although I was already of that mindset, so it proved for easy reading haha. I knocked it out real quick. Just nodding in agreement as I went along. Just checked out your interview! So interesting! Thanks Brock, glad you liked it! T.W. et al. are great folks. And of course, welcome to the site – your swing through is much appreciated.